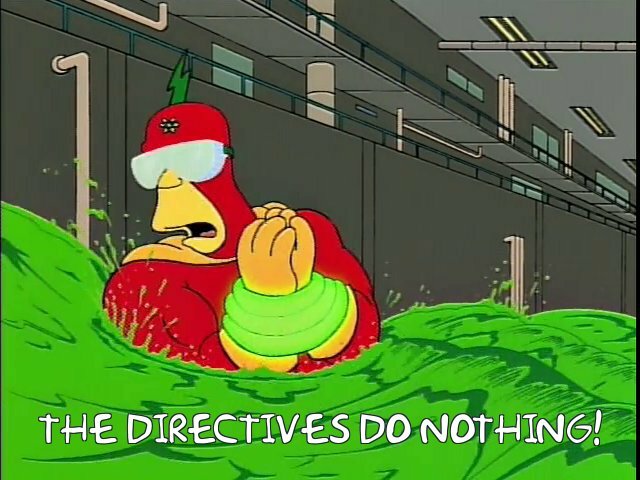 TL;DR: There is no such thing as a “none” directive in Apache 2. If you’ve got “deny from none” or “allow from none” then you’re doing DNS lookups on each host that connects regardless of whether you want to or not. I spent time trying to debug my CGI scripts and adding lots more logging and finally convinced myself that it was a problem with the Apache config and not something like MTUs or routing problems. But what was causing it? It started to feel like like a DNS related issue since the machines where it ran fine where all known to me, and so had corresponding entries in my local DNS server. But but but… I clearly had “HostnameLookups Off” in my apache2.conf file. 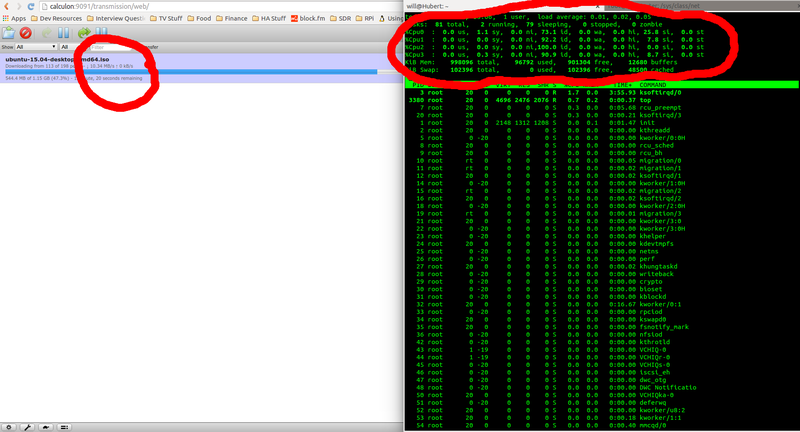 When I looked at the logs again, I noticed that indeed hostnames were being looked up, even though I told it not to. But, there is no such thing as a “none” directive. Apache interprets “none” as a host name and so has to look it up to see if it’s supposed to be blocking it or not, which causes a DNS lookup delays and hostnames to appear in your Apache logs. I run a dnsmasq server on my router (which is a Raspberry Pi 2) to handle local DNS, DNS proxying and DHCP. For some reason one of the hosts stopped registering its hostname with the DHCP server, and so I couldn’t resolve its name to an IP address from other clients on my network. I’m pretty sure it used to work, and I’m also pretty sure I didn’t change anything – so why did it suddenly stop? My theory is that the disk on the client became corrupt and a fsck fix removed some files. Anyway, the cause is that the DHCP client didn’t know to send it’s hostname along with the DHCP request. Today I have had a Launchpad account for ten years! I got started out on this road around 1992. I remember the day Stuart got a PC and installed Minix on it. That box was biege, naturally, was about 3 feet square and constructed from inch thick iron plate. Minix was totally alien when compared to the Acorn MOS and RISCOS powered machines I’d used until then, and absolutely intriguing. A few years later at university I encountered VAX/VMS and Sun SPARCstations and The Internet and Surfers and Mozilla and a Gopher connected Coke machine. Then out into the big wide world of work and run-ins with AS400 and RS/6000s running AIX. During this time I started seeing more and more Red Hat in places where there once would have been the more established players, providing email and web servers. The fascination with *nix was always there and I started using Red Hat at home for fun. I quickly ran into frustrations with RPMs and Stuart, always a source of wisdom, suggested I try Debian. Dpkg made my life a whole lot easier and I started using Debian as my default OS for everything. Pretty soon after that I found myself compiling kernels, modules and software packages because I needed or wanted something in a newer version. Coupled with the availability of cheap unbranded webcams, sound cards, network cards, TV cards etc and a strong desire to make these things work with Linux meant that I had found a wonderful way to stay up until 4 in the morning getting more and more frustrated. The phrase “I’m going home to play with the kernel” was frequently questioned by my boss Jeremy. I wanted these things to work but was endlessly faffing about trying to make it happen. “You should try this new Debian based distribution called Ubuntu” he said. So I did, and it just worked. A box fresh kernel with all the goodies I needed already compiled in and an up-to-date GNOME desktop (I’d set my allegiances before trying Ubuntu so this was another tick in the box), not forgetting one of the brownest themes known to man. And that was that. Ubuntu worked for me and I was immediately a fan. And here I am today, 10 years later, still running Ubuntu. My servers run Ubuntu, all the desktops in my house run Ubuntu, I have an Ubuntu powered phone and soon I’ll have an Ubuntu powered Mycroft with which I’ll be able to control my Ubuntu powered things while wearing my Ubuntu T shirt and drinking tea (should that be kool-aid?) from my Ubuntu mug. I salute my Ubuntu brothers and sisters. Thanks for making all of this possible. Skill level: Not for the faint hearted! A few years ago, when I started working at home, I had a second ADSL line installed so that I could still get online if my ISP had an outage. As well as fault tolerance I wanted to try and use all the available bandwidth rather than just have it sitting there “just in case”. I achieved this using multi path routing and documented the solution here: Over Engineering FTW. This has been running really well on a Raspberry Pi for about 3 years (with an older kernel, see later in this post for why) but recently the SD card has started to fail. Although this would be easy to fix; simply replace the SD card and copy my scripts over, the rural town I live in has just been upgraded to FTTC and so my connection speed has gone from about 8 Mbps to about 70 Mbps on each line. The first generation Pi doesn’t have enough horsepower to cope with 70 Mbps let alone 140Mbps, and indeed the ethernet interface is only 100Mbps. I had a Raspberry Pi 2 spare anyway so I figured I would use that and add a second gigabit NIC so I could cope with the theoretical 140 Mbps connection to the internet, and since I had two NICs I might as well use both of them. It too came with a crappy router, but no OpenReach bridge. So I had to use it. The TalkTalk router talks to the Raspberry Pi over VLAN 10. Those ports are untagged on the switch, so as far as everyone on that network knows its just a self contained LAN. With me so far? Essentially we have the normal eth0 interface of the Pi connected to one LAN with its own router and eth1 (a USB gigabit ethernet adapter) has a tagged VLAN for connection to the OpenReach bridge (eth1.1000) and an untagged default network for connecting the the main LAN. Once the layer 2 connection with the bridge is established a PPP connection becomes the second route to the internet. When a packet needed routing to the internet the kernel would do a round-robin selection of which route to use and then remember that route for a period of time. The upshot of this was, for example, that if you connected to www.bbc.co.uk and got routed first via 192.168.1.254 and so SNATed to 212.159.20.70 then all subsequent traffic for that destination also got routed via the same route and had the same source IP address. Without route caching the next packet to that same destination would (probably) use the other route, and in the case of my home user scenario would arrive from a different source IP address – my two internet connections having different IP addresses. Although HTTP is a connectionless protocol this change of IP address did seem to freak some services out. For protocols with connections the story is worse, e.g. packets of an SSH connection would arrive at the far end from from two different IP addresses and probably get dropped. Route caching was a simple fix for this issue and worked well, as far as I was concerned anyway. Im sure the reasons to remove it are valid, but for my simple use case it worked very well and the alternative, and now only option is to use connection marking to simulate the route caching. When I first looked at it I was baffled and thought I would just go back to a pre 3.6 kernel and use route caching again. But, in the standard Raspbian distro there isn’t a kernel old enough for the Raspberry Pi 2 to make use of it. 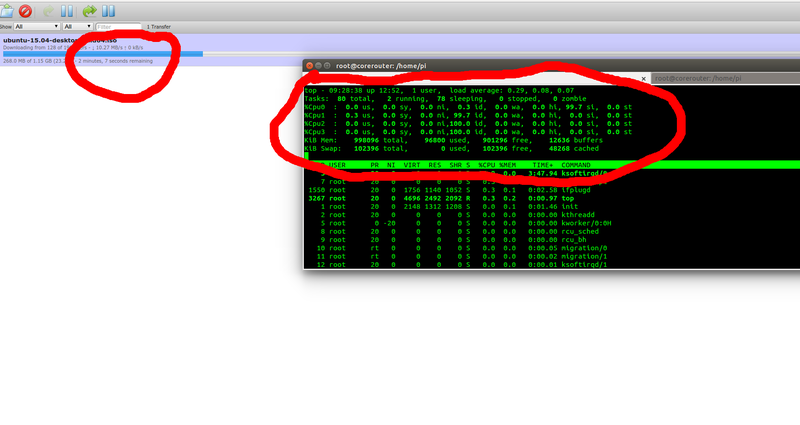 So I was stuck… I had to use a Raspberry Pi 2 to get enough packet throughput to max out my internet connections, and I couldn’t use route caching because there wasn’t a kernel old enough. This meant I was going to have to either compile my own kernel or learn to use connection marking. Joy. The documentation for Netfilter is extensive but I found a lot of it to be out of date and very hard to grok. I found a few projects who had already implemented connection tracking/marking namely FWGuardian and Fault Tolerant Router. FWGuardian is, as far as I can tell, designed for something orthogonal to my set up. Where you might have lots of connections coming in to a server, or a number of offices which need to connect to other offices via pre-defined routes. I played around with it for a while, and Humberto very kindly offered me support over email, but ultimately it was too involved and complex for my needs. You should check out the project though if you have advanced requirements. It’s got some brilliant features for a more enterprise oriented setup. Fault Tolerant Router is a much simpler setup and matched my requirements very closely. At it’s core it’s a Ruby script which can write your iptables rules and routing tables and constantly monitor the links. If one goes down it can dynamically rewrite your rules and direct all traffic down the working connection. However, it’s not expecting to use a PPP connection where gateways can change and it’s not really been tested with VLANs, although in practice it handled VLANs just fine. But, at the end of the day, I wanted to learn how to do this myself and so I used the rules generated by Fault Tolerant Router to understand how connection marking was supposed to work and then started to implement my own home-grown solution for teh lolz. As I understand it, the idea with connection marking, or connection tracking – I’m not sure what the difference is, is that when a new conversation starts the packets are marked with an identifier. You can then set ip rules to dictate which route packets with a particular mark take. In essence once a new connection is established and a route selected, all other packets in that conversation take on the same mark and so the same route. This emulates the route caching of the past. I don’t really get how, in the case of an HTTP conversation (or flow) which is connectionless, all the packets in the conversation get marked the same. This page has some more details, but I haven’t read it properly yet. Anyway, we don’t know HOW it works, but it does. Good enough. These rules set a mark depending on which interface is used. These changes happen in the mangle table. Packets going in or out the WAN via ppp1 or eth0 which are a new connection are marked with a 1 or a 2 depending on which interface they use. The decision about which route to use is done in the rules which we will see later. Any packets coming in to eth1, so from the LAN, have their marks restored on the way in so they can be dealt with accordingly. The default policy is set to DROP, so any packet not matching one of the rules are dropped. INPUT applies to packets which are bound for the router itself. Packets from the local interface are allowed, and packets from eth1 (the main LAN) are also allowed. FORWARD applies to packets which are passing through the router on their way somewhere else. Packets which are known to be part of an already in-progress session are allowed. Packets are then categorised as LAN to WAN or WAN to LAN and dealt with by the rules LAN_WAN or WAN_LAN, getting accepted and rejected respectively. 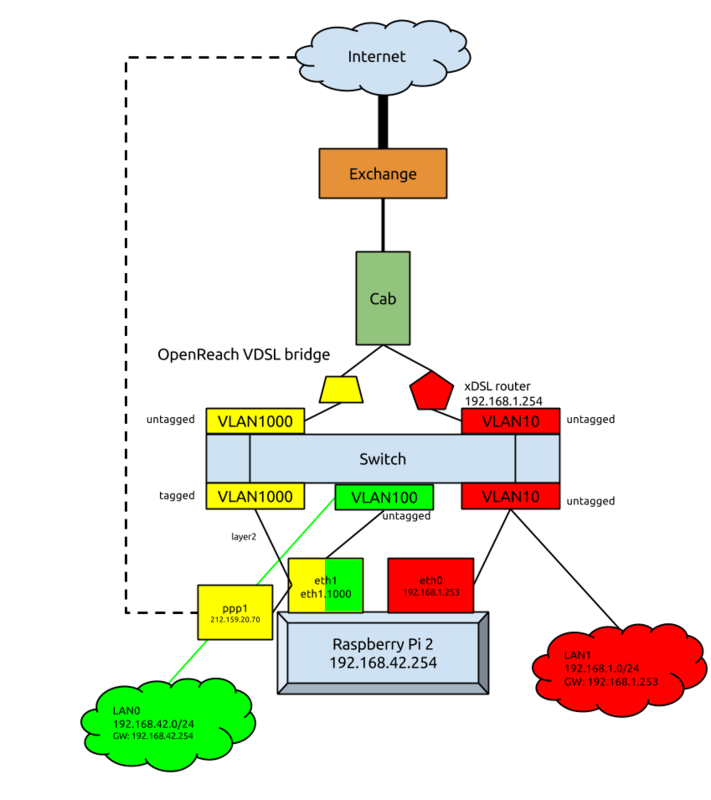 All this boils down to LAN clients using the Raspberry Pi as a router and so having their packets forwarded are allowed out and packets coming in from the internet are rejected, the exception being if they are part of an on-going connection. Clamping MSS to MTU deals with a particular issue with using PPPoE connections where the MTU can’t be the usual 1500 bytes. Because a lot of ISPs block the ICMP messages that would normally deal with asking the client to send smaller packet sizes we use this handy trick to make sure that packets can go out unfragmented. If you find that some web pages are slow to load and others are not, then try switching this on. If you’re only using upstream ISP provided routers you probably don’t need this. We’ve configured iptables to add a mark to traffic depending on which WAN interface it is going in or out of. But this is only marking the packets, there is no logic to make sure that packets of the same mark use the same route. To make this happen we use ip rules. $PPP_GATEWAY_ADDRESS is set when the PPP session is established and changes. We can look at ways to find that address later, but for now just substitute the “P-t-P” IP address from “ifconfig ppp1” or whatever your ppp interface number is, or in the case of an ISP-provided router, the LAN side IP of that router. This is simply creating a routing table with the name of the ISP that will be used and a default route which can find its way to the internet for that ISP. which is the same idea as we used in the old route caching days, a round-robin route which flicks between the two available routes to the internet. We’ve now created the iptables entries to track and mark traffic from each of the two ISPs and add some basic firewalling and IP masquerading. We’ve also created a routing table for each ISP and a load-balancing table which splits the traffic between the two ISPs. The rules are matched in numerical order based on preference and once a rule matches that’s it. The first two rules make sure that traffic from the routers uses the correct table. The important rules are the last three. Traffic which has been marked “1” will always use the plusnet routing table, traffic marked as “2” will always use the talktalk routing table. This ensures that all traffic which is part of an on-going conversation will always use the same router out to the internet, and so always come from the same IP address. The last rule only matches traffic which is not already marked i.e. new conversations. This routing table, as can be seen in the previous section, has a multi-path route to balance traffic between the two routes out. Once a conversation is established the IPtables conntrack rules will mark the traffic and so one of the two fwmark rules will match. And that’s it. You should now have a router which splits the traffic fairly evenly across two internet connections and keeps tabs on which packets should go out of which routers. I’ve had this running for a month or so now, and it seems to be working fine. I’ve had the Pi lock up a couple of times, but I think that’s related to the USB gigabit ethernet adapter. Services such as unblock-us allow you to work around some geographic content blocks by acting as your DNS server and replying with the IP address of, say, the US based Netflix server instead of the UK ones. I’ve installed dnsmasq on my Pi as well and configured it to use the Unblock DNS servers instead of my ISP or Google servers. The clients on the LAN get their network configuration over DHCP from the Pi which sets the DNS server address for the clients to the Pi itself which then handles DNS lookups using the Unblock servers upstream. This works really well for most Netflix clients but I was having a lot of problems getting the Chromecast to work with Netflix and Unblock US. It turns out that Google have hard-coded it’s own DNS servers into the Chromecast and so your local DNS settings are ignored. Nice one Google. Using the NAT table we rewrite the DNS lookup bound for Google’s DNS servers to send it to our dnsmasq server instead. lol. Network cards have queues for tx and rx. Higher end cards will typically have more queues, but on the Pi the on-board NIC (which is actually connected via USB) has one for tx and one for rx, as do the VLAN interfaces and the PPP interfaces. Each of these queues has a CPU affinity and it seems that by default the queues all use the same CPU core. If you’re interested in helping to make the scripts a bit more generic and adding fault-tolerance let me know. In summary; a Snappy application is secure because it’s wrapped with AppArmor. It’s easier to install and upgrade because everything is packaged in a single file and installed to a single location. That location is backed-up before you install a new version, and so if the installation goes wrong you can revert to the previous version easily by copying the original files back (or rather, Snappy will do all of that for you). Simplifying things slightly there are two types of Snappy “application”: Apps and Frameworks. Frameworks can extend the OS and provide a mediation layer to access shared resources. Apps are your more traditional top-level items which can use the provided frameworks, or bundle everything they need in to their Snap. This makes things much easier for app providers because they are now in charge – they can be assured that no library will change underneath them. This is a huge benefit! Then launch the virtual machine. This command port forwards 8022 on your local machine to 22 on the virtual machine, so you can SSH to port 8022 on localhost and actually connect to the Ubuntu Core machine. It gives the Core machine 512MB of RAM, nicely achievable on a modest budget (The Pi2 has 1 GB). We also forward port 1883 from to the VM, which will allow us to connect to the Mosquitto server on our VM once it’s all installed. Once it’s booted you can connect to it with SSH. The username and password are “ubuntu”. Time to build Mosquitto. Before you run the commands below, a bit of background information. The cmake line will force cmake to install the binaries to the location specified with INSTALL_PREFIX, rather than /usr/local. This is required to bundle all of the binaries and other files to the “install” directory we created above, making it possible to package as a Snappy. nproc spits out the number of processor cores you have, so the make line above will use as many processor cores as you have available. It’s not required, and for Mosquitto which is fairly small it’s not worth worrying about, but for a bigger job this is quite handy. If you look in the “../install” directory you’ll see a familiar structure containing all the goodies needed by Mosquitto. Copy the list from the previous command to the clipboard and then paste it in to terminal where this command is running and hit Ctrl-D to submit the list. The script will then search Ubuntu Core for the libraries required. If it finds them they will be displayed, if it doesn’t then they are not available in Ubuntu Core by default and will need to be included in your Snappy package. linux-vdso is the Linux kernel and is available on every Linux system by default, so we don’t need to provide that specifically. libssl, libcrypto, libpthread, librt, libc and libdl are all available in Ubuntu Core by default – so we don’t need those either. That leaves just libcares to be copied in to our package. We should already be in the ‘lib’ directory, hence the ‘.’ above. We are copying libcares in to the lib directory of our Snap, and when we run the Snap we will pass in the library path to make sure Mosquitto can find it. More on this later. Information about these fields and what they mean is available in the reference linked to above, but they are easily understandable. A comment on the name though, you need to append .<yournamespace> where your namespace is as you select in your Ubuntu myapps account. One thing to mention, you can see that to start our Snap we are calling a shell script. This allows us to pass in extra options to Mosquitto when it runs. This is a Snappy package for Mosquitto MQTT broker. We also need to configure our Mosquitto server, by editing the conf file. Most of the settings can be left as default, so we will create a new conf file with only the bits in we need. We need to change this to run as root. Since our Snap will be confined there is no risk here. I expect the ability to run as non-root users when using Snappy will be improved, but really it’s not necessary. If you see an error about ImportError: No module named ‘click.repository’ then you likely have a clash between the Click library version in the SDK team PPA and the version in the Snappy PPA. This will be fixed soon, but in the meantime I would suggest installing ppa-purge via apt-get and then running sudo ppa-purge ppa:ubuntu-sdk-team/ppa. If you see an error about “expected <block end>” in the package.yaml check the whitespace in the file. It’s likely a copy and paste error. If everything has gone to plan Mosquitto should now be running on your virtual machine. In order to test you’ll need to write a test Publisher and Subscriber. I used the Python Paho library. print "Time server starting up...."
We’ve built a Snappy package for amd64 (or whatever your native architecture is), but we really need to be cross-architecture to give people the best choice of platform on which to use the package. This involves cross compiling, which can be tricky to put it mildly. A huge “Thank You!” to Saviq and Didrocks for doing the actual work and letting me watch. If you haven’t, you should take it for a spin. If you have an Intel graphics everything should be fine and dandy, if not YMMV at the moment. You can now boot from your USB stick and have a play with Unity 8. Right now you’ll be seeing the Phone view of Unity 8, but that will all be changing in time. Then switch back to tty8 (ctrl-alt-f8) and use Unity. but there is probably a better way. The option “-s” will resize the captured frames. Note that 683 384 is exactly half my native resolution, so you will need to adjust this to your display. The option “-n” will capture n frames and then stop. At 60 frames a second, 3600 frames is one minute. If you use -n then mirscreencast will exit gracefully at the end. I am lucky enough to have a spare machine with a touch screen just for running Unity 8 on (http://www.dell.com/uk/dfh/p/inspiron-11-3137/pd) so I SCP the raw video file on to my main machine for playback and editing. And then you can edit and upload the processed file. When I export from OpenShot I use the “Web” profile, then target “YouTube-HD”, “HD 720p 29.97 fps” “Med” – it’s a bit overly compressed, but it looks OK. In which no Raspberry Pi’s are seen. 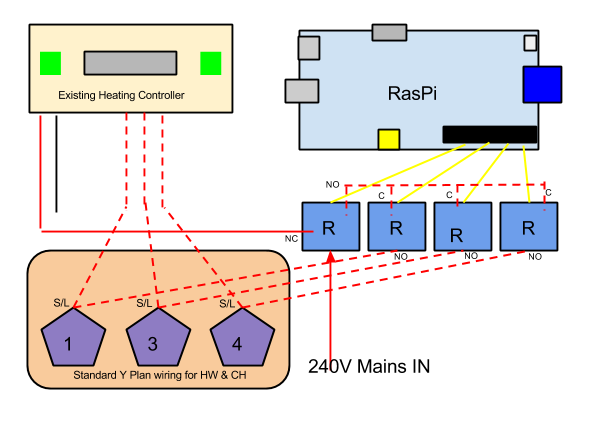 TL;DR: It should be fairly straight forward to add a Raspberry Pi controlled heating and hot water system to a standard UK domestic set up and, more importantly, remove it again without messing with the existing set up. As a minimum you’ll need a Raspberry Pi and 4 relays. A few other bits and bobs wouldn’t go a miss though. The theory checks out, I’ve ordered the bits, come back next time to see what it looks like. It occurs to me that – for a long time we’ve had a thermostat in our homes which switches the heating off when it gets warm enough, but wouldn’t it be just as useful to have something which turns the heating on when it gets too cold? This thought, together with a Raspberry Pi that wasn’t doing much and a strong desire to make my home more connected, led me to think about how I might control my heating system from, say, a smart phone. I’m far from being the first person to think of this idea, and there are loads of really good examples out there, but none of them did quite what I wanted in the way I wanted to do it. So I’m going to start from first principals and walk through this project design to try and build a removable & non-destructive add-on to an existing system. I’m writing this at the very start of the project, so I’ve no idea if it will work, if I will break some expensive components on way to getting it working, or if I will just give up before I get to the end. Let’s see. A crude diagram of how the central heating system works in a typical UK home. The boiler burns gas and heats water. That hot water is circulated around the system (called the primary circuit) by a pump and can do three jobs. It can circulate through a heating element in a hot water cylinder and heat more water which is stored in the cylinder. Note that the water which circulates through the element does not come in to contact with the actual water it is heating, the two are kept separate for water quality reasons. The second job it can do is circulate through radiators in the home and hear the air. The third job is to do both. The hot water from the boiler moves around the primary circuit losing it’s heat to either the hot water in the cylinder or the air and eventually passes through the boiler again, heats up, and goes round and round again. There are two “header” tanks of cold water in the loft. One is for the cold water to the bathroom for flushing the loo, filling the bath, brushing your teeth, that kind of thing. This tank also fills the hot water cylinder. The other is the header tank for the primary system and ensures that it can’t boil dry. Both use gravity and water pressure to make sure the water flows to where it is needed. The system in the diagram is an “open” system. If the hot water in the cylinder gets too hot it can expand up the vent pipe and dump itself in to the cold water tank. The cold water tank can over flow to outside. If the hot water in the primary gets too hot it can expand up in to the header tank ready to be reused to fill the primary when the water cools. There is such a thing as a sealed pressurised system which doesn’t have these vents. These are more complex and if you have one please be very careful in tinkering with the control mechanisms. In an open system, if you get things wrong and the boiler runs and runs you would end up with a lot of steam in the loft. In a pressurised system things can go pop and blast you with boiling water. That said, in an open system you could still end up dumping a header tank full of boiling water down on to the bedrooms below. People have died from this happening, so tinkering with the heating system is not something to be taken lightly. Y Plan electrical wiring plan for central heating and hot water. There are multiple “standards” for wiring up a heating system. You can find heaps of information on the excellent DIY FAQ wiki. My system has been wired in the “Y Plan” configuration and if you have a single 3-port valve in your airing cupboard and a couple of tanks in your loft – then there is a good chance you have too. I will run through the wiring, and some of the inherent safety systems built in (which is why I’m keen to make sure my controller is a simple replacement for the existing controller, and is not a complete re-wire). Before we start though, a further word of caution. Mains electricity is lethal. You need be comfortable playing with this stuff to consider attempting anything to do with the heating system. It’s also probably illegal in UK due to some draconian restrictions on what a home owner can and can not do to the wiring in their own home. Don’t try this at home kids. A competent tradesman might be able to help you hook it all together. The incoming mains supply goes through a double pole switch which will disconnect live and neutral when switched off. In this diagram, the live feed provides power to only the controller (sometimes you might see a parallel (switched and fused) connection to the boiler from that live). So first and foremost, all power to the components comes through the controller. Neutral is common to pump, boiler and valve and so is earth. Thermostats are placed in series for both the hot water circuits and the heating circuits. These will physically break the circuit when a specific temperature is reached. Let’s consider this example: I tell the controller to heat the water. It connects the live feed to the “HW ON” cable via point 6 on the diagram. The current flows to the cylinder stat, which allows the current through since the temperature is lower than the trigger point it is set to. 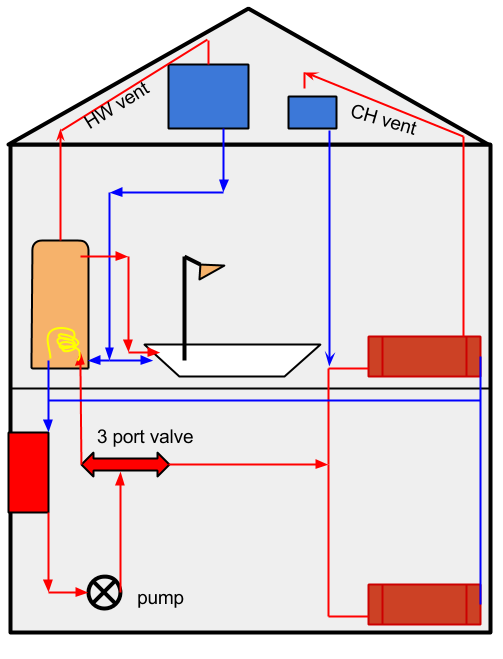 The pump and the boiler are connected in parallel so you can’t run the boiler with out the pump running too (at least that’s the plan), and they are provided power via the room stat to point 8 on the diagram. The boiler is told to turn on, and the pump moves that heated water around the system. The hot water reaches the three port valve. The valve has an electrical actuator on which moves to set position depending on what electrical connections are made to it. In our case, no INPUT power is being applied to the valve, so it sits in it’s default position – which just happens to be “Hot water mode”, and so the heated water from the boiler passes through the hot water cylinder only. 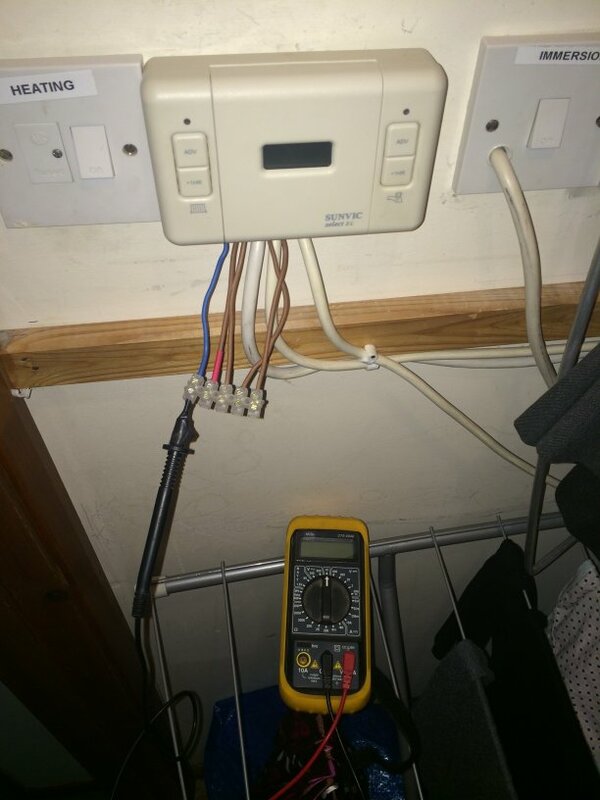 When the hot water cylinder get’s to the right temperature the thermostats clicks over to the other contactor and now no power is applied to the pump and boiler via the HW ON output on the controller. Instead, the grey wire, point 7 on the connector, is energised. This tells the valve that HW is no longer required. This system is pretty safe, since as soon as the cylinder stat is triggered power is removed from the boiler and so it would shut down. Now, thermostats do fail, but they usually “fail safe”, but sometimes they don’t. What if I want just the heating to run? The controller connects to the live input to the CH cable via point 4 on the connector. This passes through the room stat which will allow the current to flow if it’s below the temperature set. The current ends up at the valve via point 5 on the connector. 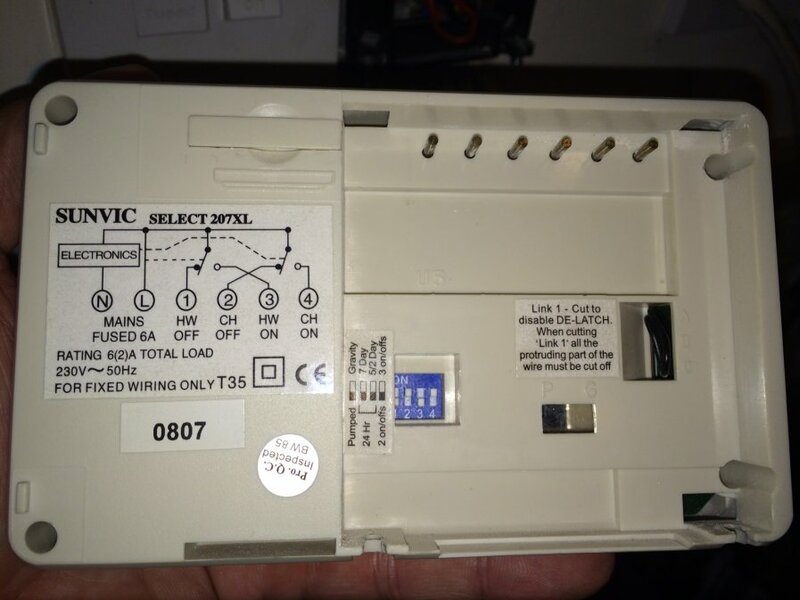 In this case, where we only want heating, the “white” wire is live (it’s black on the diagram) and the valve connects the “white” wire to the “orange” wire which goes back to point 8 on the connector, and in turn provides power to the boiler and pump. At this point the “grey” wire is also energised, as the controller makes it’s “HW OFF” output live when you ask for only heating. The room stat is able to cut power to the circuit when it reaches the set temperature. If we want both hot water and heating, the controller energises the “CH ON” and “HW ON” outputs. Here current is provided to the pump and boiler when any of the thermostats indicates that more heating is required. If the HW reaches it’s temperature first, then the stat energises the grey wire, which tells the valve that no more hot water is required, and so it will move to the CH ONLY position, and current will continue to be provided by the orange wire when the valve reaches the correct position. The heated water from the boiler will stop circulating through the hot water cylinder and go only through the radiators – concentrating the heating to where it is needed. Pretty neat! This system strikes me as being both simple and brilliant at the same time. It’s also pretty safe, as long as the stats are working as they should do. I’ve looked at the plumbing, and I’ve looked at the wiring, and I’m pretty sure that I know what’s going on. Next thing to do is apply the scientific method and gather the evidence to back up my assumptions. The first thing I did was to turn off the power to the heating system. I’m paranoid, so I turned it off at the fused connection to the left of the controller and also at the fuse box. I also wore rubber boots, and jumped in the air every time I touched a wire. Better safe than sorry, eh? And, rightly so it turns out. The fused connection unit did actually cut all the power to the heating system, but look carefully at the third connection from the left and you’ll see an earth wire being used to carry live current. This is against all the regulations. Whoever installed this system originally was clearly a free spirit. I was also quite impressed that they’d managed to squeeze all the connections in to a double gang back box. What a mess. Remember kids, only a competent person is allowed to fiddle with these things – they do a better quality job you see. Looking at the zoomed in image you can see 6 terminals: N, L 1, 2, 3, 4. N & L are self explanatory. 2 is not connected to anything, and so I don’t need to worry about it. So that leaves three connections that do something (1, 3 and 4). Exactly what I was expecting. One will be CH ON, one HW ON, and one HW off. Which is which? My theory is sound! 1 is HW OFF, 3 is HW ON, 4 is CH ON. I wired in a few bits of cable and then (not shown) removed the connections to the rest of the system (labelling where they came from when I removed them!). I left the L & N connected. To recap, I removed the existing wires from 1, 3 and 4 and replaced them with my cables which came down to some screw down connector blocks. The reason I put connector blocks on the end was two fold. Firstly, to make it easier to probe with my multimeter and secondly to stop me accidentally brushing against one of the cables and giving myself a shock. I also labelled the permanent live with a bit of red heat-shrink, just so I don’t get confused. Exactly what I expected. Point 1 must, therefore be “HW OFF”, point 2 “HW ON” and point 3 “CH ON” – which they are, as we saw from the back of the controller. I’m now confident enough with the set up to proceed with roughing out a block diagram for the controller and ordering the parts. 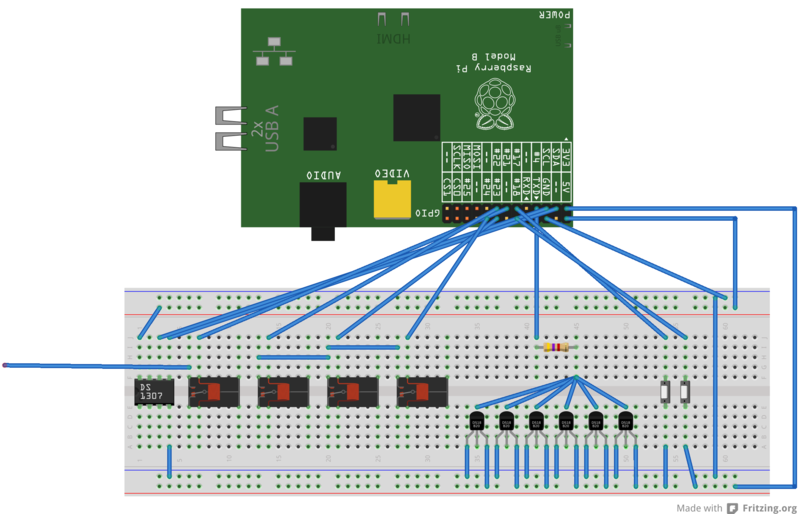 This rather unclear breadboard layout (with the awesome http://fritzing.org/home/) logically lays out what I intend to do. I’ve also added a crude block diagram for good measure. First, I will add a real-time clock module. They’re cheap and easy to fit. This will provide the Pi with a source of time when it can’t talk to NTP servers, and so it will be able to turn things on and off at the right times, even when the network connection is down. Next I will add four relays. I will take the main 240V incoming supply out of the existing controller and put it through relay 1. This relay will pass the supply on to the existing controller via the “Normally Closed” relay output. When I switch this relay, the supply to the existing controller will be dropped, and instead routed to the other three relays which will then be able to switch this current. These three relays will be wired in parallel with the existing controller connections, much like in the image above showing the test harness connected in to the controller connections. That is to say: one relay will go to point 1, one to point 3 and one to point 4. The existing safety features (thermostats in series in the circuits) are un-changed and so still offer the same protection. 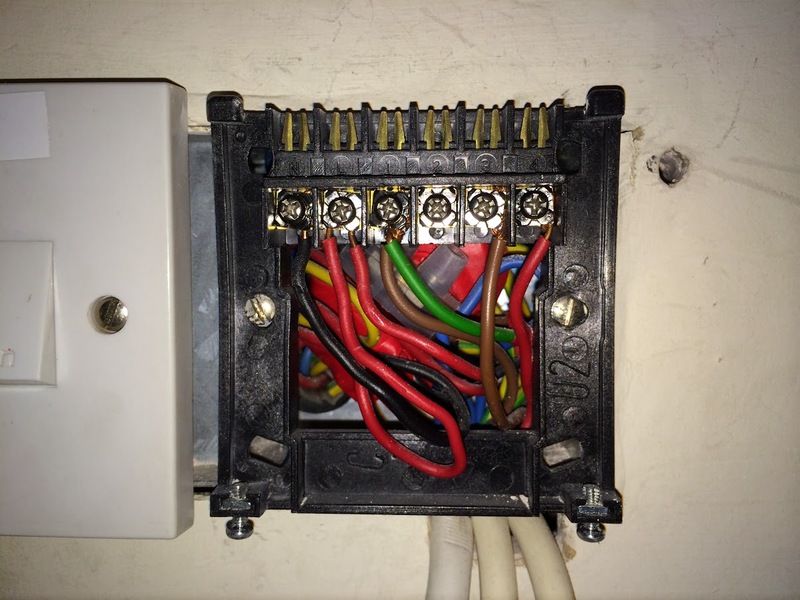 In order to activate heating or hot water we switch the relays as per the table above. By adding my new system in parallel and being able to easily switch between the two I can bring the RasPi powered one online gradually. A few hours here, a few hours there. And once I’m happy that it’s not going to go crazy I can leave it unsupervised for longer and longer periods. It also means that if I update the software and break something, we can still wash. I will also add a number of 1wire temperature sensors. I will have three on the hot water cylinder: 1 at each of the top, middle and bottom. This will give me insight in to how much hot water is in the cylinder, and the temperature thereof. This is not intended to be a safety system. The temperature readings from these sensors will not be relied upon to switch things off in an emergency, that will be left to the original thermostats, but – we could use these readings as well to help make decisions. I will also fit a temperature sensors in the cold water tank, the primary header tank and somewhere outside. This will give me insight in to a couple of things: Firstly, how cold is the water in the CW tank, and what is the temperature outside? This has a direct effect on the number of showers that can be had from a given amount of hot water at a known temperature. Useful for trending too. Secondly, fitting a sensor in the primary header tank can report when the header tank is getting hot. Really, the header shouldn’t heat up too much. If it does then either the system is “pumping over” – where the pump is forcing water up the vent pipe pipe OR the water is so hot it has expanded enough to push water out of the vent, or I expect some combination of the two. Either situation is sub-optimal, and with a sensor in the header tank I get some visibility of what’s going on. I might also add a sensor to the boiler input and output, so get an idea of how much work the boiler is doing. Adding a sensor to each room would be a nice addition at some point too. 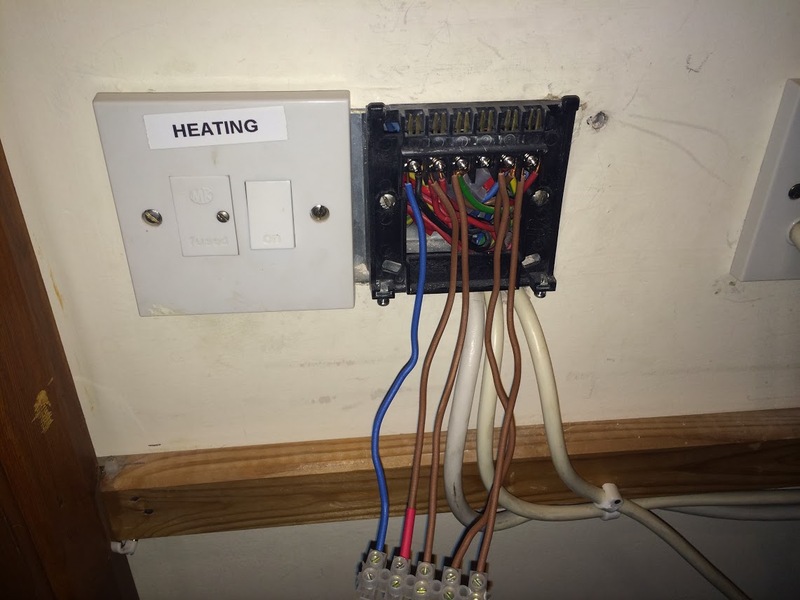 A couple of switches will be added for manually switching the hot water or heating on/off from the airing cupboard, where the current controller is situated and where the more senior visitors to Whizzy Towers will expect the heating buttons to be. A short bit of twin brown and earth for the connections between the 1st relay and the original controller live input. Couple that with a few odd bits of wire, some LEDs a bit of Python and we should have ourselves a Raspberry Pi powered heating and hot water controller which is relatively safe, easy to remove and cheap to build. Let’s see what happens when all the bits turn up. Should be here in a week or so. I’ve had this idea for a while and with the discovery of the Google Text-to-speech and Voice Recognition AGI scripts from Zaf (http://zaf.github.io/asterisk-googletts/ & http://zaf.github.io/asterisk-speech-recog/) I’ve implemented a quick proof-of-concept. Over the next few days I’ll tidy up the code and write up a blog post about how to do it. It’s pretty straight forward though, using APIs provided by Google, MythTV and Asterisk and then just glueing them together. So that I remember for next time, and so I can start writing down some of the issues I’ve had to sort out since re-building my servers, here is what you have to do to tune to a DVB-T2 mux in MythTV (0.27 fixes). If that doesn’t work, and you know it should (as in you are on the same transmitter) try setting the tuning timeouts higher. Also, just blindly re-trying because “WHY DOESN’T IT WORK” seemed to help.